The Atkins Diet involves restriction of carbohydrates to switch the body's metabolism from burning sugars as fuel to burning stored body fat. There are four phases of the Atkins diet: induction, ongoing weight loss, pre-maintenance and lifetime maintenance. Induction is the most restrictive phase of Atkins, it is a stage to get the body used to fat, and cure cravings for unacceptable foods. Gradually, carbohydrate levels are raised to slow weight loss and add more acceptable foods (these foods are added back in order: Fresh cheese (Primal), Nuts and seeds (Paleo and Primal), Berries (Paleo and Primal), Alcohol, Legumes, Other fruits (Paleo and Primal), Starchy vegetables (Primal in moderation), and then Whole grains). Once the weight-loss goal is reached, carbohydrate levels are raised again to a state of equilibrium where no weight is lost or gained, which may or may not be below USDA norms, depending on the individual's metabolism, age, and their exercise level. According to Atkins, hunger is the number one reason why low-fat diets fail and that the Atkins diet is easier to follow and stick with because the restriction of carbs and increase in protein consumption tends to decrease the onset of hunger; because fats and proteins take longer to digest than carbohydrates. 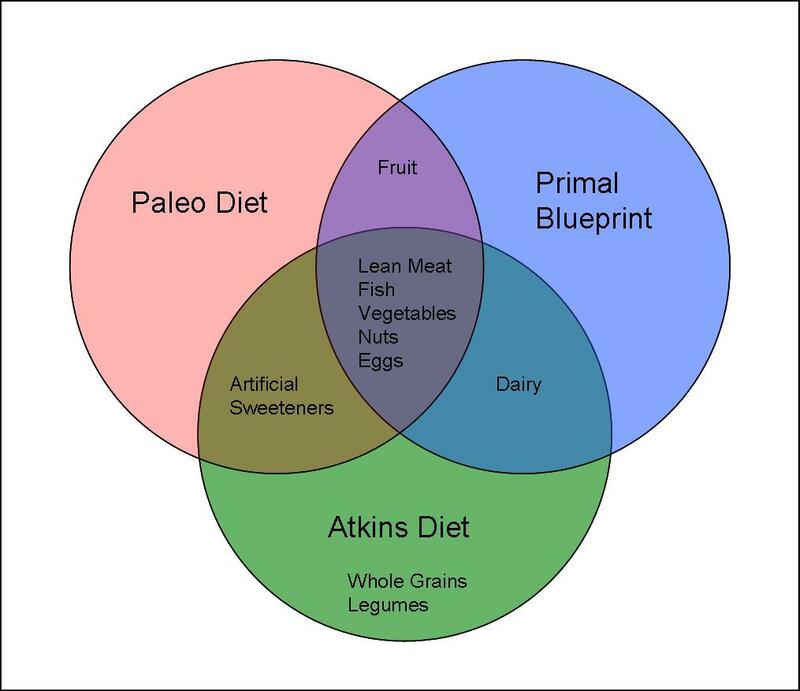 Many people believe that the Atkins Diet promotes eating unlimited amounts of fatty meats and cheeses (the Atkins Diet recommends that no more than 20% of calories come from saturated fat-- A little higher than Paleo/Primal recommendations). 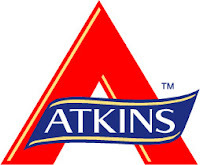 Although the Atkins Diet does not impose caloric restriction, or definite limits on proteins, Atkins points out in his book that this plan is "not a license to gorge." 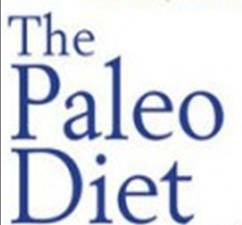 The Paleolithic diet (paleo diet), also referred to as the caveman diet, stone age diet and hunter-gatherer diet, is a nutritional plan based on the premise that modern humans are genetically adapted to the diet of their Paleolithic ancestors and therefore an ideal diet for human health and well-being is one that resembles this ancestral diet. Natural selection had sufficient time to genetically adapt the metabolism and physiology of Paleolithic humans to the varying dietary conditions of that era. But in the 10,000 years since the invention of agriculture and its consequent major change in the human diet, natural selection has not had time to make the optimal genetic adaptations to these new foods. As a result, excessive consumption of these Neolithic and Industrial era foods (grains, legumes, dairy products, refined sugar and processed oils) are responsible for the current epidemic levels of obesity, cardiovascular disease, high blood pressure, type 2 diabetes, osteoporosis, cancer, autoimmune diseases, acne, depression, as well as vitamin and mineral deficiencies. The "contemporary" Paleolithic diet consists of foods that can be hunted and fished, such as meat, offal (marrow, bones, and organs) and seafood, and can be gathered, such as eggs, insects, fruit, nuts, seeds, vegetables, herbs and spices. Food groups that were rarely or never consumed by humans before the agricultural revolution are excluded from the diet, mainly grains, legumes (e.g. beans and peanuts), dairy products, salt, refined sugar and processed oils. Fruits, vegetables, lean meats, and seafood are more nutrient-dense than refined sugars, grains, vegetable oils, and dairy products. Consequently, the vitamin and mineral content of the Paleo diet is very high compared with a Standard American Diet (SAD). Meat and seafood represent a particularly rich source of omega-3 fatty acids and other micronutrients (iodine, iron, zinc, copper, and selenium) which are crucial for proper brain function and development. Two notable exceptions are calcium and vitamin D. Modern humans require much more vitamin D than hunter-gatherers, because they don't get the same amount of exposure to sun. In order to avoid deficiency, a modern human on a hunter-gatherer diet would have to take artificial supplements of the vitamin, ensure adequate intake of certain fatty fish, or increase the amount of exposure to sunlight (it's been estimated that 30 minutes of exposure to mid-day sun twice a week is adequate for most people). The Paleo Diet advises to eat only lean cuts of meat, free of food additives (preferably wild game meats and grass-fed beef since they contain higher levels of omega-3 fats compared with grain-produced domestic meats). Practitioners are permitted to drink mainly water, tea, coffee, diet soda (I disagree with this one!). 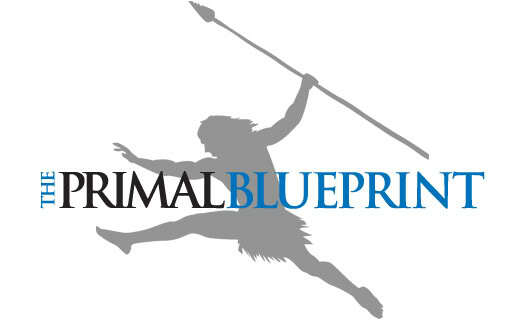 The Primal Blueprint is based on similar evolutionary science as the Paleolithic Diet. Both suggest limiting carb intake (grains), eating more meat and including lots of veggies. But amid this common ground are some significant differences. The fundamental difference is the role of saturated fats; two Primal favorites are butter and coconut oil. Saturated fats are seen as a critical source of nutrients for neurological functioning and other essential physiological processes (Paleo has come along in recent years and is now a proponent of sat. fats in moderation). The thought here is that early humans left virtually nothing of the animal carcasses they were so fortunate to hunt. They would have favored not the lean muscle meat but the richer organ meats, bone marrow and even fat deposits (the denser the food energy, the more likely they would live to see another day). Another divergence from the Paleo diet is the role of diet sodas and other artificial sweeteners. The opinion of many in the Paleo community is that as long as it’s not sugar, it’s acceptable (The thought here is that artificial sweeteners, i.e. Splenda, do not effect the body in the same way sugar does, so if you absolutely have to use it, ok, but it’s best to wean yourself off all sweeteners eventually). Although the Primal Blueprint doesn’t demonize the occasional use of artificial sweeteners, it makes the stipulation that if you aren’t getting anything positive from the meal or drink, you shouldn’t be taking the risk of the artificial sweetener. Finally, The Primal Blueprint was designed for the purpose of guiding all elements of healthy living, not just a nutrition plan. The Primal Blueprint recommends appropriate supplementation to counter the stressors and toxins unique to our life today. In its fitness and stress management approach, the Blueprint highlights and capitalizes on our natural physiological functioning. It also emphasizes the overlap of good diet with essential fitness and relaxation principles to maximize muscle mass and to defend against preventable factors in aging. So there you have it... written down, in black and white! Paleo is not just like Atkins! Hey girl! Paleo actually does NOT allow artificial sweeteners. No way, no how. Nothing artificial. Where did you get that information? Diet soda is completely OFF the Paleo list of acceptance. Robb Wolf covers it in his newsletter titled, "The Myth of the Acceptable Paleo Sweetener."